UPDATED: Wed., Jan. 17, 2018, 5:19 p.m. 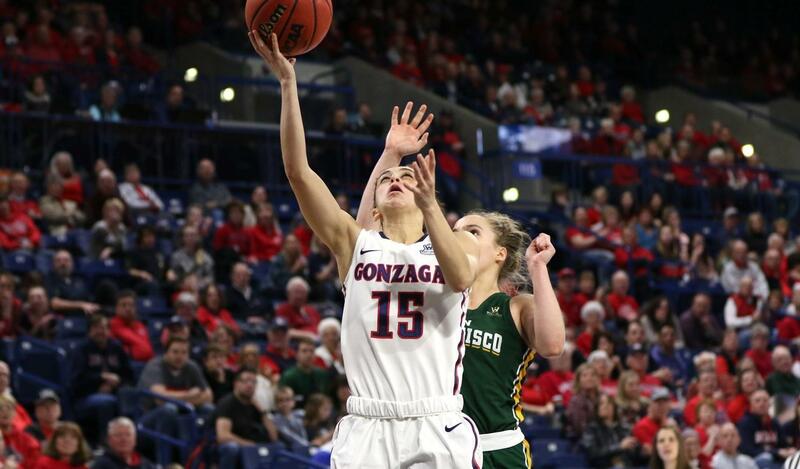 Finally, the Gonzaga women are in the meat of their conference schedule, or at least the appetizer. Thursday’s game at Saint Mary’s is the Bulldogs’ first major West Coast Conference test of the season. A win over the Gaels would keep GU (13-4, 6-0 WCC) alone in first place. Then it’s back to the usual fare, with consecutive games against Santa Clara, Portland and San Francisco – combined WCC record 4-14. Blame the schedule-makers, but the main course – two games each against BYU and San Diego, plus the return game with Saint Mary’s – is compressed into the last four weeks of the regular season. “It’s an unfavorable schedule,” GU coach Lisa Fortier said before practice Tuesday. This is also the second consecutive split week for the Bulldogs, who are home on Saturday against Santa Clara. GU has no choice try to make the most of it, beginning Thursday in Moraga, California, against its biggest challenger in the WCC race. “They’re one of the best teams in the conference,” said Fortier, who in the same breath said she was thankful to get five days to prepare for the Gaels. Saint Mary’s (12-5) is tied for second in the WCC standings with BYU at 5-1. The Gaels’ Stella Beck, Megan McKay and Sydney Raggio shoot better than 50 percent from the field, with the 6-foot-3 McKay averaging 15.6 points and 6.7 boards. Fortier picked the Gaels to win the conference (coaches aren’t allowed to vote for their own team). GU is playing its best ball of the season. In a 74-47 home win over USF, the Bulldogs tied their season high with seven 3s, forced 20 turnovers and had 20 assists. “For the most part, our guards are creating a lot of havoc,” said Fortier, who got a career game against USF from sophomore point guard Jessie Loera (15 points, nine assists). Published: Jan. 17, 2018, 3:57 p.m. Updated: Jan. 17, 2018, 5:19 p.m.